There is nothing quite as horrifying as opening a package from your pantry and finding webbing, or bugs, inside. There are few people who like eating bugs, or the unhatched eggs of bugs. One scary thing about pantry pests is that they can be hard to see. Some eggs are almost invisible to the naked eye. And some larvae live inside the food they are feeding on. Here are a few common pests you could find in your pantry, and what you need to know most. There are a number of beetles that can invade pantry food products. The most common found in South Portland homes are flour, drugstore, sawtoothed grain, cigarette, spider, and dermestid beetles. While they share the name beetle, they do not share the same habits, habitats, food preferences, or treatment needs. Therefore, proper control requires proper identification of the infesting pest. The most effective way to prevent a beetle infestation is to closely examine food packages before you purchase them. Look for holes or damaged seals that would allow insects to get inside. Once a beetle infestation has taken root, it is best to have a professional use industry standard pest protocols and products to contain and eradicate the problem. But, if you have not been infested yet, you can significantly reduce your chances of a widespread infestation by storing all of you pantry products in sealable plastic containers. This will also keep these foods fresh longer. It is important to point out that weevils are technically beetles. Both weevils and beetles are in the order Coleoptera, but weevils are of the family curculionidae, which contains over 1,000 individual species in North America alone. Fortunately, you're not going to find all of these species invading your pantry. In South Portland, the three most common weevils you may find are named by the food they prefer, names like rice weevil, maize weevil, granary weevil, and bean weevil. All of these weevils, save for one, share the characteristic that differentiates weevils from beetles visually, a snout that is as long as its body. The odd weevil out is the bean weevil. It has a short snout and an oval shape, like its beetle cousins. Weevils are a frustrating pest that can get into your home from the outside. Typically, they will invade in mass numbers. If you find these pests on the walls of your pantry, a vacuum cleaner is your first line of defense. Be sure to dispose of the bag outside when you're done. You'll also want to do a detailed inspection of the exterior of your home and seal any holes or gaps you find. Make sure all screens are in good working order. And look closely at weather stripping and door sweeps to make sure they have good contact all the way across. We've put moths last because there is only one moth that is commonly found in South Portland pantries. This moth is so connected to pantry invasion, it is often called a pantry moth. But, its proper name is the Indian meal moth, or Plodia interpunctella. And, though it is last on our list, this is the pest you are most likely to find in your pantry foods - well, more specifically, its larvae - also known as caterpillars. Adult Indian meal moths don't eat pantry foods. In fact, they don't eat anything. Their only job is to mate and lay eggs. But, since they lay their eggs in pantry foods, you might see these two-tone, part orange part brown moths flying around in your pantry. Adult pantry moths are a warning sign that something in your pantry isn't fit to eat. But, don't just look for pantry moths in your pantry. The Indian meal moth is attracted to light, so you may have them fluttering around in other parts of your house as well. If this pest is in your food, they will appear as tiny, pale caterpillars with dark brown heads. You'll have to look closely, as they are under ½ an inch in length. While it is definitely no fun finding the caterpillars of Indian meal moths in your food, these creatures are not dangerous to consume. They do not crawl on counters or climb in trash like other illness-spreading pests. Most of the lifecycle of an Indian meal moth will take place in the packaged food it was hatched in. It can be extremely hard to find the source of a pantry pest infestation, and this is a pest problem that can plague a home for a long time. 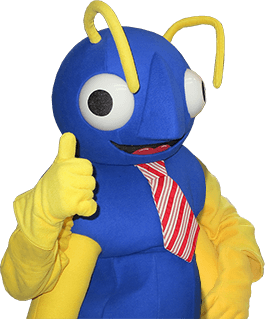 If you're finding pantry pests in your South Portland home, let the educated pest specialists here at Big Blue Bug Solutions locate the source of your infestation, and deal with it completely. Life tastes better without pantry pests. Protect your pantry with Big Blue Bug Solutions.